Thousands of fishermen line the Maumee River on foot and boat for the Great Ohio Walleye Run. The tiny dots on the left are fishermen wading in the river, one by one for miles. Boaters line the center of the river. It’s a walleye fishing frenzy on the Maumee River every spring. It has been a good winter for ice fishing, but now it’s time to start looking ahead to the spring fishing season. Treat yourself to something special this year and start your spring fishing season off with a bang. Ohio is famous for its Lake Erie “Walleye Run,” and if you have never made it up to the Maumee River in Toledo for this incredible event, then you should. It’s definitely a fisherman’s must and top tier bucket list item. 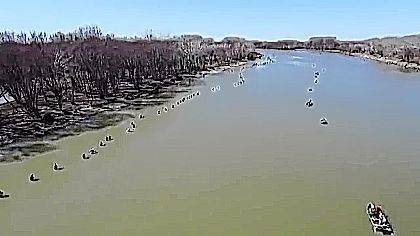 Every spring up to a half a million walleye make their way up the Maumee River in Toledo from Lake Erie for their world famous spring run. Depending on water temperatures and river levels the walleye can begin their legendary run as early as the first week of March. Thousands of fishermen from the region and from all over America flock to the Maumee River for this annual tradition. It is truly a spectacular event to watch and an adventure to fish. At this time of the year, Maumee can take partial claim to Lake Erie being called the Walleye Capital of the World. This is such a big deal that Toledo has established a Walleye Hotline to monitor current conditions for anglers. The walleye Hotline number is 419-407-9731. The best place for catching these walleye is along the town of Maumee and south several miles up the Maumee River. This would be north of Ewing Island, then south to Tall Timber Rapids at the south end of Side Cut Metropark on the west bank. When the run begins, first will come the 18 to 20 inch jacks then the big females will follow. 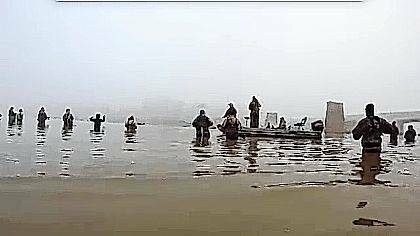 Close to a half million walleye have entered the river in past years to begin their journey to the spawning grounds of the Maumee river. Wading in the Maumee River and casting up stream is the most popular way to catch these spring spawners. Literally thousands of fishermen are standing in the river and fishing boats are roaming as far as the eye can see. Many vendor trucks and vendor stands can be found selling baits, tackle, food and such.